As previously discussed on this site's Home Page, my Creative Investing Strategies involve accumulating a multi-faceted portfolio. I purposely steer away from specific recommendations pertaining to brokers and traders or traditional, more conventional investments. I do however, endorse certain commodities that display favorable historic gains and stability. In my opinion GOLD should top that list. Physical precious metals are considered to be safe and stable investments. Therefore, gold perpetually remains one of the most popular precious metal investments. Unlike money, gold has a real physical value and is a very tangible asset. Globally recognized as a legitimate method of payment, it cannot be counterfeited and therefore, provides security against the fluctuating purchasing power of paper currencies. ​However, the value of gold can be subject to market fluctuations. Ultimately, whatever is right for you will determine your private evaluation. We recommend only certified gold ensuring the highest quality standards. With direct access to gold, even when demand is high, we suggest gold bars in diverse sizes, as well as a selection of coins. For private and professional investors, we offer evaluation of capital markets and access to reliable trading desks. These provide 24/7 precious metals trading and monitoring of your portfolio’s performance online. We can also arrange to store your gold in a high-security vault. There, your gold deposit is comprehensively insured, and can facilitate any future acquisitions or sales. ​Always invest in a way that is decidedly right for you. Whether you are looking for sustainable performance, the security of a physical asset, or the flexibility to invest in a range of precious metals, we have the solution right for you. ​For further information or learning more about gold please Contact us. I will be delighted to provide you with a no cost consultation. Eery single gold based currency has eventually failed. Gold stopped circulating as the money of normal transactions, as currency. So, avoid the misunderstanding of history that leads many to regard gold as the world’s only true and permanent money. The historical facts are that although it has been frequently tested, depending on the prevailing economic circumstances, it both disappears and re-appears. ​What is different about gold and other forms of money is the way they disappear, and why. Gresham’s Law, a common sense rule in economics, states that “bad money drives good money out of circulation”. Because its natural qualities recommend Gold as a high quality form of money, it often becomes an unwilling victim of the perpetual cycle. Given a choice of spending good money (gold) or bad money (inflated paper) most people will spend the paper and keep the gold as a store of value. Anyeconomy where economic and political considerations have combined to produce a paper currency it runs parallel with gold. Where that currency is showing the early signs of being dangerously expanded in supply, people elect to hold on to gold and spend paper. Magnified millions of times by everyday transactions in a typical economy this eventually eliminates gold circulating as money. ​For many similar reasons, when their time is up, paper currencies will pour into circulation as people look to buy hard assets. Eventually, the only value in the banknote is to use it as heating fuel. The significant difference is that paper money, having lost all value, ultimately disappears permanently. Gold only disappears temporarily, but always retains its value over the very long term. The history of the past 4000 years shows that when circumstances are right, gold returns. Quite important to understand are the causes for these historical economic cycles. A prudent investor must learn to recognize them, and to act appropriately. If you own gold at a time right for you it will be a fast appreciating asset while normal business assets, and money itself, are tumbling in value. 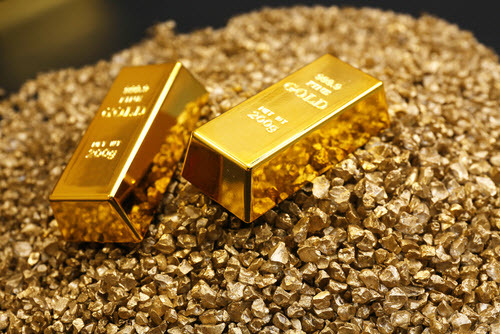 ​Owning gold while in a good phase can be very profitable. In the five years after the 1929 crash gold's investment purchasing power rose 17 times. During the 1970s gold's investment purchasing power rose 15 times. ​So far in gold's current resurgence, with the economic situation looking as hostile as the 30s and the 70s, gold's price has multiplied by about 3 times. By comparison with those previous cycles it is still nearer the bottom than the top. But gold lost nearly 7/8ths of its investment purchasing power between 1980 and 2000. That was during the best period for growing businesses in the twentieth century. That price slide warns that smart investors should never grow too fond of gold! Even in times when the economic future appears pretty grim, the time will come when the outlook for business improves. Most people will either not realize it, or will remain too nervous to do anything about it. Then it will be smart to sell your gold, and use its purchasing power to invest in people and businesses, and to participate once again in the dynamic creation of real wealth. The people who manage to do this will be the smartest of all gold buyers. By not hoarding gold for its own sake, they have positioned themselves to be able to actively invest in a recovery - which is a long term strategy. By doing this they will be both profiting themselves and serving their communities at the same time. Capital which has not been adequately protected right now will simply not be there to invest in the business opportunities of the future. Everything is best enjoyed in moderation. Likewise, too much gold, or mismanagement of it can reap greater negative results than the desired positive. For further information regarding Your personal financial future, please consider my offer for no cost consultation. Contact me with any questions or concerns. I am available to help you achieve your specific goals. I'll even assist You in the creation of those goals!